Despite my many visits to Washington, DC, I have never been here during the prime viewing time for the cherry blossoms. So, I go into this trip with no expectations, and can only hope the cherry blossom spirits are on my side. Peak bloom is now April 6 to 8 (today!). But perhaps more importantly, Sakura Matsuri is the largest one day display of Japanese culture held in the United States. It is held in April, as the climax to the National Cherry Blossom Festival. The Japan-American Society of Washington was formed to promote friendship and understanding between Japan, and the greater D.C. area. The Society introduces all forms of Japanese culture to Washington DC audiences. The Society runs the area’s oldest and largest Japanese language school for adults. One of the Society’s major tasks is to introduce the next generation of Americans to Japan and the world beyond our shores. The Society’s honorary chairman is my friend, Norman Mineta, former Congressman and Cabinet Secretary. This year’s Sakura Matsuri will be held on Sunday, April 13, 2013. It was first held here in 1961. The Festival attracts upwards of 140,000 visitors over a seven hour period. The Sakura Matsuri is a family friendly festival. There are over 15 vendors of Japanese food, two beer gardens, 30 exhibitors of Japanese arts and culture, 15 vendors of Japanese products, and over 30 hours of live performances on five stages, including traditional and popular Japanese music and dance and martial arts demonstrations. A specific part of Sakura Matsuri appeals to me. It is the centuries old custom of picnicking under the cherry blossoms, called hanami. The custom is said to have started during the Nara Period (710-794). The Tokugawa Shogun was instrumental in planting numerous areas of cherry blossoms to encourage common people to picnic as well. Would you believe that it is such a big deal in Japan that the Japanese Meteorological Society track the sakura zensen (cherry blossom front)?? As it moves northward with the approach of warmer weather, the nightly forecasts follow the weather segment of the evening news. The blossoms begin in the south, in Okinawa in January, and reach Tokyo and Kyoto in end of March or early April. Likewise, in the DC area, the cherry blossom watch tracks the blooming season. The average peak bloom date is April 4, but the peak bloom date in 2012 was March 20! But it is rather difficult to predict the bloom dates much more than 10 days before peak bloom. The National Park Service monitors five distinct stages of bud development, by which they provide forecasts and updates. The problem for us on the west coast is booking air and hotel some weeks in advance. Peak Bloom Date is defined as that period when 20 percent of the blossoms are open until the petals fall and leaves appear. The blooming period starts 14 days before the peak bloom date, and can last for as long as 14 days, unless frost, wind or rain shorten this period. This may be more than you want to know about cherry blossoms. But when you have been chasing them for as long as I have, why not. Not even a trip to Japan could quench my “thirst” to see the peak cherry blossom blooming period. This is just one more try! We have a week to see it all. The National Cherry Blossom Festival is opening with a weekend of family activities at the National Building Museum. The free family days event runs Saturday and Sunday between 10 a.m. and 4 p.m. The museum will offer crafts and activities focused on architecture, the cherry trees and Japanese arts. An opening ceremony for the National Cherry Blossom Festival is planned for Saturday at 5 p.m. at the Warner Theatre. The festival runs for five weeks through April 27. 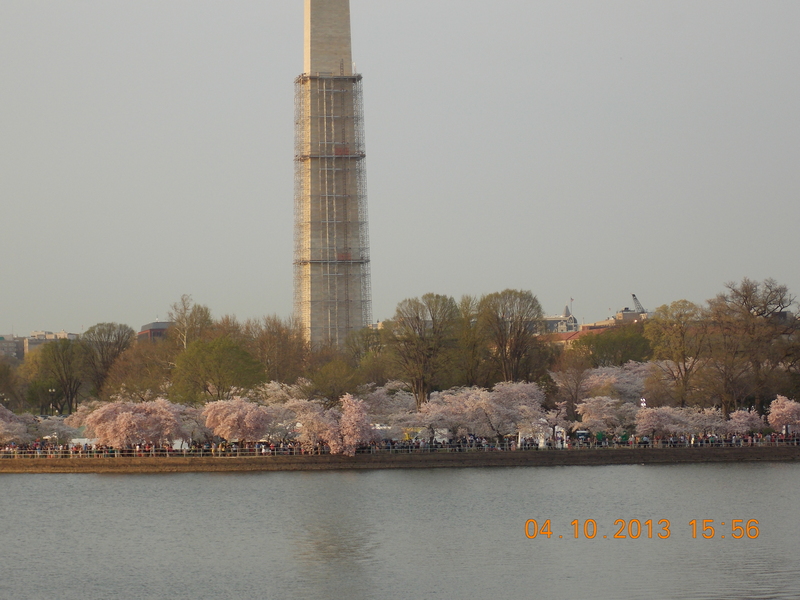 The National Park Service says it expects the trees will be in full bloom between April 6 and April 8. 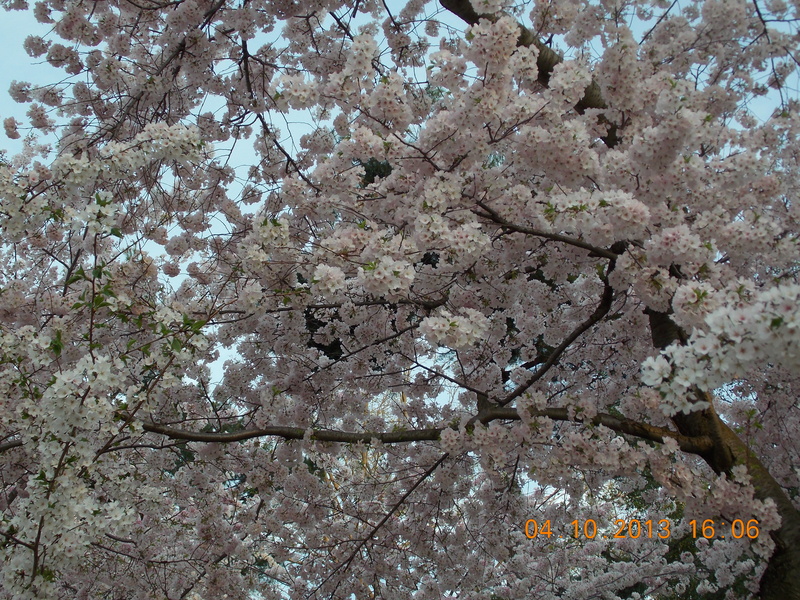 Officials say the cold weather slowed the blossoms’ growth. 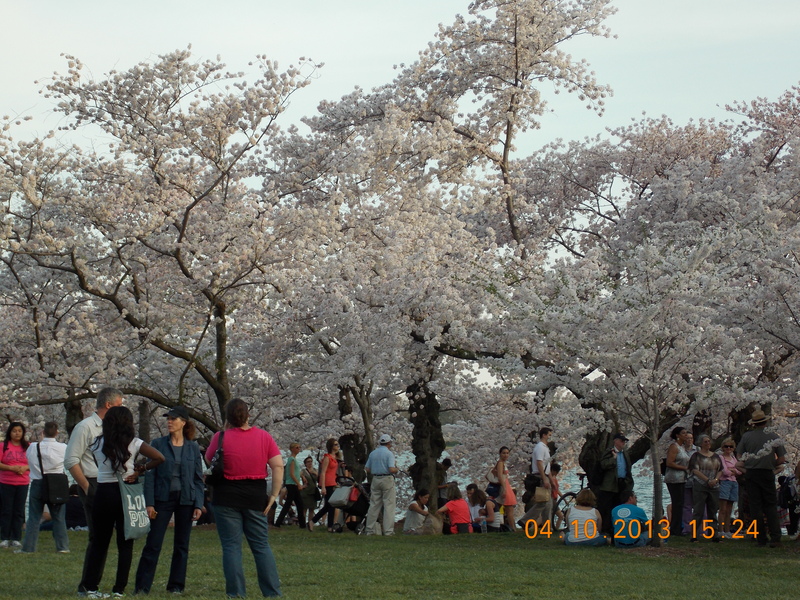 The cherry blossoms draw about 1 million visitors each spring. This year marks the 101st anniversary of the gift of trees from Japan. Actually, April 10 was the perfect day and we were there!! !